There is a great deal of confusion about what drove us to the current government shutdown. The head-scratching by the media and by policymakers exists because of their tendency to look at the Congressional votes and maneuvers in isolation. The polls will continue to be scrambled and the pundit's predictions will be off because the paradigm of politics has changed fundamentally in America and most insiders are in denial about it. Considering that the new political dynamic has been slowly encroaching for the last twelve years it is probable that even Chuck Schumer, Mitch McConnell, and most of the opinion class don't understand how the once scripted gentile Kabuki theatre of the Senate has become raucous improvisational Lucha Libre. The reason for the confusion is that there is not a widespread understanding that Capitol Hill is no longer the center of political discourse in America. There was a time when a couple of "gentlemen" quietly meeting in the Senate cloakroom could decide on a course of legislative action that was both face-saving and effective. 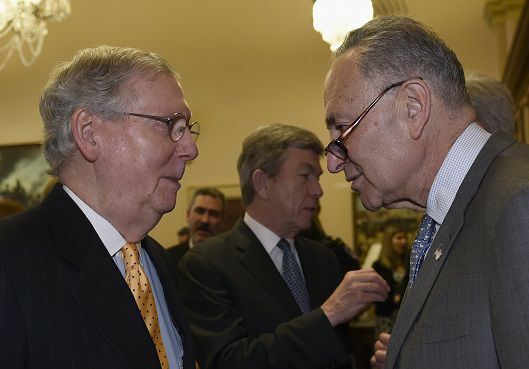 Both parties could walk out to the Senate floor and say they had great respect for each other even if they disagreed and claim they won the argument and take a vote. Columnists from either perspective would repeat the Capitol Hill talking points, complain about not winning 100% of the argument but claim they got the best of each other. Since it would be years before the average American felt the impact of the policy change there would be few immediate repercussions. Social media, news sites, blogs, talk radio and 24-7 cable news have changed the process forever. Let us note that the current Cabinet has to compete for the Presidents attention with talk show entertainers. While we all can decry the malpractice by Trump’s decision-making process we would be foolish to believe that this not a sign of the times. Do any of us believe that the next President won't, to some extent, have influential infotainment voices in mind even as she/he hears advice from their closest advisors? Beyond broadcast and cable, social media drives the political conversation in a way that the US Senate never dreamed of. Keep in mind that while the government was being shut down and millionaires sat at an unhosted Mar-a-Lago anniversary millions of Americans were on the streets around the country protesting the current state of politics. When you take the 360-degree view the immense and powerful government shutdown was not the main event on Trump’s anniversary it was a piece of evidence, Exhibit A, of the incompetence and cruelty that the Women's marches were framing as an issue. The women's protests historic attendance, publicity, and coverage were driven by social media. During the Bush Administration when groups of concerned Americans decided to protest the Iraq invasion the protests were not well covered by broadcast or cable media. Bush utilized "safety zones" to shield him from coming contact with protestors. The media robotically followed President Bush with cameras that were at times over two miles away from any protesters. In 2004 Facebook was born followed in 2006 by Twitter and the center of the political debate is now fluid, decentralized, and erratic. This weekend was not Trump's or his powerful White House apparatus, it was not the possession of Congress, it belonged to the Women's marches and the shutdown. While pundits argued, Senators fought, and Speaker Ryan whined the real influencers were marching, posting, and setting the debate parameters that will determine the 2018 election cycle. Need more proof that the paradigm has changed? Then take further note because I save the best and most ubiquitous for last: The morning that the marchers marched a group of undocumented millennials had already turned the lights off in federal buildings and shut down a host of U.S. public services around the world. The DREAM'ers accomplished their muscle flex without much coverage from mainstream newsrooms or even from progressive outlets. DREAM'ers did not hire a blue chip D.C. lobby firm or even initially employ a top-rated political consultant. Most Americans can not even name one of the dozens of the DREAM movements leaders. Yet the DREAM'ers have shut down one of the most powerful governments in the world utilizing web-based tools. The DREAM’ers have the U.S. Congress reacting even though the House and Senate still do not fundamentally understand how they arrived at the crises or why they cannot adequately end it in a wood-paneled cloakroom. The paradigm has changed and Capitol Hill is lost.